Stella, my new puppy (can you believe it), recently received a free Bionic ball from Bionic Pet Products to review. My puppy is four months old and is cutting adult teeth. If she nips, well it hurts! So, I’m trying to keep her overloaded with plenty of chew toys. Since this is the first post featuring Stella, I’ll tell you she came from a rescue group who described her as a Schnauzer mix, but my vet thinks she’s a German wirehaired pointer mix. You’ll see much more of her, I’m sure! Take a look at Stella with her Bionic ball. In case you’re wondering, yes, she did get it from under the shelf! Pool Time: The Bionic ball floats for fun water play, so if you’re looking for a pool ball for your dog, maybe this is it. Short Bounce: It doesn’t appear to have a wonderful bounce against hard surfaces like a patio or ceramic floor. 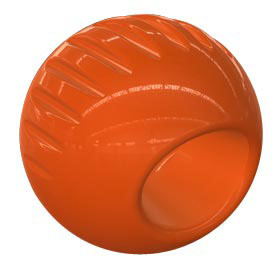 The ball bounces some against the spine, but doesn’t do much against the openings, which are designed for treat stuffing. Open Center: The open center is rather large and not very practical for treat stuffing. I’m puzzled that the manufacturer suggests stuffing this ball with treats, but I suppose you could smear peanut butter inside the ball. Scented: The packaging says the ball is vanilla scented, but I could only detect a very faint scent. Perhaps it smells much more vanilla-like to a dog! This company, inspired by a Lab named Duke who destroyed his toys with ease, also makes a Bionic bone, Bionic Toss-N-Tug and a Bionic Stuffer. Have you tried Bionic pet toys?